Whatever, congrats to the "winners", better luck and all that rot to the "losers", I am sure they will be crying all the way to the bank. Yuh, I am particularly cynical today. I had a great weekend, I got to do stuff with my pawrents and on the whole it was good. The yukky snow is almost all gone, except for what the hoomans "stockpiled" in ugly brown mounds, it is ... all melted. Why? Well because something happened this weekend that reminded me that we NEED to spread the word. You know, we "do our theng" on Sundays. Daddy always takes us to the pet places and we socialize and do our shopping. [Mostly we watch momma read labels, put things back and utter the words "Junk, crap, caca, ewwwww, vile, toxic, poison, chemical cesspool, EPA worthy...." you get the idea. But the old gal does get creative, stuff comes out of her mouth that is downright funny because momma is a master at mixing metaphors and while she does not intend it to be funny it is funny. Just don't laugh in front of her. She is just full of "momma-isms". I will have to make a list for you, someday. Some day when she is not reading this. So, there we were at a "pet place" and there was this magnificent HUGE black great dane. Awesome looking dog. Handsome even. And you know my sister, The Wendy. Being a "big boned girl" she loves BIG BOYS. When she saw him she got so excited that she let out a loud hello while wagging her tail like a crazed propeller on a prop plane trying to take off. It was just a "hello". I swear. No growls, no malice of any kind. Well this "big BOY" got... so scared that he ran and hid behind his momma. I am serious. He hid. In fear. Of The Wendy???? Are you kidding me? She is Miss Fearful herself? She is a lover, not a fighter!! His momma needs to go here: http://gulahund.se/ read up on this, and get this boy a big fat yellow ribbon so that people know that he has some space issues. And maybe, then the fear triggers could be avoided. That poor boy was being tortured by a zillion triggers... there were big and small two leggeds wanting to pet him, other four leggeds wanting to sniff him, and let's not forget the lights, the music, the noises... so why do that to him? Anyway, momma and the Wendy apologized for "being triggers" but honestly... who knew?! Momma told his momma about the yellow ribbon campaign. Will that lady follow up???? Who knows. 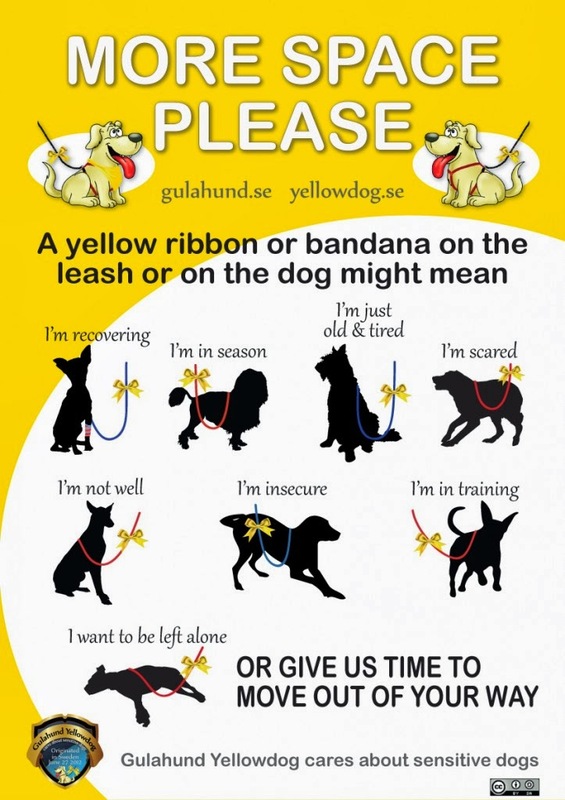 TIE A YELLOW RIBBON already! Give your four legged the space he needs and deserves. Mhhh what color is the ribbon for "Don't touch me, I am a germaphobe"? I need that color. Spread the word. Be heard. GIVE THEM SPACE, and tie a yellow ribbon. Hi Silvie, Thank you so much for posting this; Hunter is very timid and shy which causes him to be a target for more dominant dogs. I love this idea. When Hunter sees a dog he doesn't know, if we are walking, he may growl and bark-but trust me that he would turn and hide if the dog came near him. I guess Bichons are just lovers and not fighters.